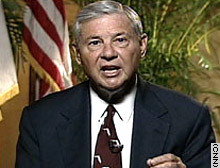 The Florida senator created an exploratory committee with the Federal Election Commission on February 27, 2003, and made an official announcement May 6. On October 6, 2003, Graham became the first Democratic hopeful to drop his presidential bid. Citing fund-raising difficulties, Graham told Larry King, "I'm leaving because I cannot be elected president of the United States." A moderate Democrat, Graham was on the short list for vice president in 2000. He was critical of the Bush administration's decision to go to war in Iraq, saying the administration was ignoring other critical national security threats. Editor's note: This chart features brief summaries of candidates' viewpoints on some issues, based on their statements and records. Most candidates have offered more comprehensive explanations of their positions on these and other issues. More information may be found on their campaign Web sites.  AG: Attorney General; ANWR: Arctic National Wildlife Refuge; CAFÉ: Standards that provide tax and other incentives for consumers to purchase and alternative fuel vehicles; COPS: Community Oriented Policing Program; DOMA: Defense of Marriage Act; GLBT: Gay, Lesbian, Bisexual, Transgendered; NCLB: No Child Left Behind; NMD: National Missile Defense.